The melody in Shen Qi Mi Pu is quite singable using the lyrics found in <1491 and following the traditional pairing method, though some re-alignment is needed of the words and tablature. In common with the other melodies in Folio I of Shen Qi Mi Pu, the original tablature had no punctuation. 1539 does, and in two places it has phrasing different from that given in <1491. The lyrics, included below with the section titles, give a good idea of the theme of this piece. In earlier surviving qin sources I have not yet found the attribution made here to "the same person who wrote Qiuyu Zhao Maoting", i.e., Cai Yong or Zuo Si. Besides my own there are two other recordings, by Yao Gongbai, following his father Yao Bingyan's reconstruction, and by Liang Mingyue on the Taiwan recording Xiaoxiang Shuiyun (SMT or SMCM 1017). Liang plays the Kaizhi as a preface (see comments). this piece was written by the same person who wrote Qiuyue Zhao Maoting. The interest of the piece lies in my having cherished thoughts, but no way to tell this to anyone. There are emotions about the present time (being inappropriate), longings for antiquity, or laments (for someone), but there is no way to express any of this. If someone don't understand music, how they share (my feelings)? Once I was thinking of a learned person I knew in the past, and I wanted to tell him (or her about this), but I could not do it, so I wrote this piece. (And) in the past when the wise men said the Dao was not prevailing, this meant they were longing for a sage. Of old it was said, "I think of a good friend and how the world is one place (but we are not together), so I want to go be with him because I cannot forget him." These are (ancient) sayings. the mountains are lonely and I am nostalgic for the good old days. from this distance I think of my old friend and wonder where he is. old friend, I constantly dream of meeting you. How hard it is to recall the joy of a pleasurable meeting! I am unable return to (you in) Chang An. The road is distant, the tall trees make the road dark, and the world is vast. and our strong feelings go to waste. and the flowings streams are swallowed by the setting sun. 2. For Huangzhong mode, slacken 1st, tighten 5th strings each a half step. For more details on this mode see under Kai Zhi and in Shenpin Wuyi Yi. For more on modes in general see Modality in Early Ming Qin Tablature. 3. See Zha's Guide 3/33/42. More details are in the appendix below. There are two afterwords with the Jinyu Qin Kan tablature (ibid., pp.199-202, QF 1373-6 [.pdf 2.9MB]). The first afterword, by Peng Qingshou himself, begins "憶古人，亦名山中思友人或空山思故人...," i.e., the melody is also called Shanzhong Si Youren or Kongshan Si Guren (25994.11xxx); it also mentions t he possible connection to "Cai Zhonglang" (Cai Yong); it then has some general comments on the music - the old version I believe, including its use of a different tuning. 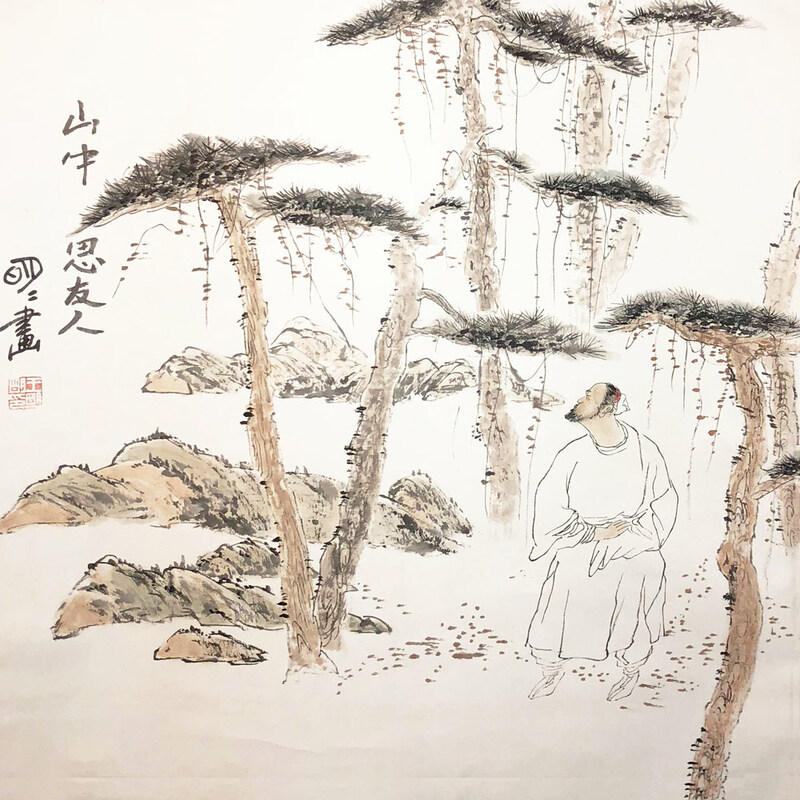 The second part, by 張子謙 Zhang Ziqian (1899-1991), then goes on to give some details of the Peng Qingshou melody and its actual origin: he had apparently learned a version of it as a child. This association with Cai Yong ssems to be borrowed from the melodically unrelated Shanzhong Si Youren: there is no related title in the Caishi Wunong or listed amongst his Qin Cao. Some later copies of the modern Yi Guren also mention this connection (e.g., 2000, p.165). However, the version published in 1961, where it is called Kongshan Yi Guren, associates this same melody with Wang Ziyou visiting his old friend Dai Kui on a snowy evening, saying there is a tradition that Dai Kui wrote the melody thinking of his friend Wang (compare the melodically unrelated Ziyou Fang Dai). The modern Yi Gu Ren is very popular today, with many recordings available. The Jinyu Qin Kan tablature is reprinted in Tong Kin-Woon's Qin Fu, p. 1367. It is also copied in such other publications as the Yinyinshi Qinpu and the Wumen Qinpu. Guqin Quji, Vol. 2, p. 116, has a version as played by 顧梅羹 Gu Meigeng, with staff notation, also saying his version comes from the Liqinxuan Qinpu. 5. For the original Chinese text see 山中思友人. The version with slower tempo was influenced by singing the lyrics (traslation above). (1937; QF/1367) Yi Guren: "憶故人，亦名山中思友人或空山憶故人"